Advanced Mathematical Tools for Control Engineers: Volume 1 provides a blend of Matrix and Linear Algebra Theory, Analysis, Differential Equations, Optimization, Optimal and Robust Control. 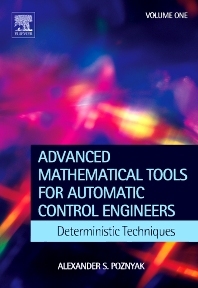 It contains an advanced mathematical tool which serves as a fundamental basis for both instructors and students who study or actively work in Modern Automatic Control or in its applications. It is includes proofs of all theorems and contains many examples with solutions. It is written for researchers, engineers, and advanced students who wish to increase their familiarity with different topics of modern and classical mathematics related to System and Automatic Control Theories. Undergraduate, graduate, research students of automotive control engineering, aerospace engineering, mechanical engineering and control in Chemical engineering.